Misamis University's President, Dr. Karen Belina Feliciano-De Leon, received 1st place - Outstanding Participating Institution, on behalf of Misamis University. 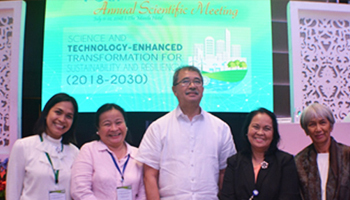 The award was given during PERAA’s 39th Annual Meeting on July 20, 2018 at the Bai Hotel Cebu. The honor is given to participating institutions with consistent performance as active and exemplary members of the Private Education Retirement Annuity Association (PERAA). PERAA provides adequate and affordable retirement programs to participating private educational institutions through the achievement of economies of scale from commonly managed funding and retirement arrangements, and by operating as a non-profit organization administered by a highly motivated and competent Board of Trustees where Misamis University’s president, Dr. Karen, is a member. Misamis University has been a member of PERAA since December 1974. Ms Bernadette Nepomuceno, PERAA President, Fr Antonio Samson S.J., PERAA Chairman, Dr. Karen Belina F. De Leon, Misamis University President and PERAA Trustee, Dr. Orlando D. De Leon, Special Assistant to the President, Misamis University. Earlier on the same month, Dr. Karen also received the Distinguished Physiatrist Award from the Department of Rehabilitation Medicine, College of Medicine-Philippine General Hospital, University of the Philippines Manila during the celebration on the occasion of the 40th National Disability Prevention and Rehabilitation Week "Kakayahan At Kasanayan Para Sa Kabuhayan Tungo Sa Kaunlaran".